Agastya Rasayana is a highly effective tonic for the organs of the respiratory system. It is used to treat asthma, chronic bronchitis, tuberculosis and other diseases of the respiratory system. Agastya Rasayana - rejuvenating medicine that helps to restore the normal work of the respiratory system. In addition, it is shown in as a preventive measure smokers. Those who recently quit smoking, it is also good to drink a course of this medicine to cleanse the lungs from harmful substances. 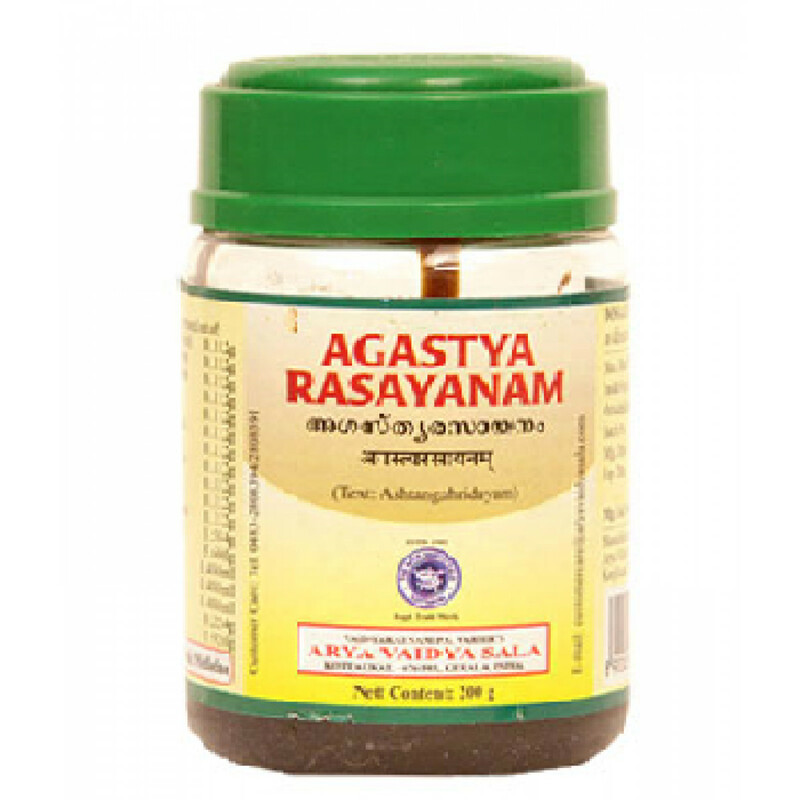 Agastya Rasayana clears the respiratory tract of toxins, helps to eliminate phlegm from the bronchial tubes, helps to bring the body soot cigarette smoke, dust. Agastya Rasayana boosts immunity and vitality, slows down aging. Also Agastya Rasayana is used in disorders of the digestive system - bloating, lack of appetite, loss of taste. Indications: cough, shortness of breath, chronic bronchitis, tuberculosis, whooping cough, asthma, influenza, acute respiratory infections, pneumonia, chronic cough, pleurisy. Content: Bilva, Syonaka, Gambhari, Patali, Ganikarika, Shala-Parni, Prsni-Parni, Brhati, Kantakari, Goksura, Svayangupta, Shankhapuspi, Shati, Bala, Hasti-Pippali, Apamarga, Pippali, Chitraka, Bharngi, Puskara Mula, Yava, Haritaki, Ghee, til oil, Madhu, Jaggery. Dosage: 1/2 - 1 teaspoon twice a day. Or by prescription of a physician. Original name: Agastya Rasayana Arya Vaidya Sala. In our store You can buy authentic Agastya Rasayana Arya Vaidya Shala at the best price!